See More Bug Hunters Here This Professional RF Detective Pen Design will give you 24/7 privacy protection. Use it to find interfering devices, built in protection to prevent most mobile phone interferences, attache it to your Keys, Car, Gym Bag, Inside Purse or Briefcase so you always have it nearby. 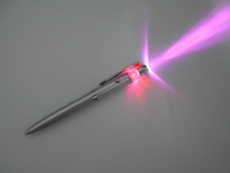 Use it to detect the wireless signals in your location, the detective pen will give flash is a signal is detected, the flashing will increase the nearer you get to the signal source, it can also be used to detect forged bank notes.